With the country continually eager to find new ways to health and happiness, Emily Ashworth looks at how farming can play a vital role in producing the nation’s favourite and most popular foods. As the old adage goes, you are what you eat and as society’s obsession with healthy cooking, food sourcing and gut-busting ingredients grows, we must not forget that farmers are the ones actively tuning their businesses to provide the goods. We have witnessed how trends can appear overnight and with the use of social media, can catch on phenomenally quickly. But with so much demand for certain foods and new waves of exercise and fitness regimes developing, it is a key chance for farmers to really hone in on the health and wellness industry, a sector that will always be relevant to consumers and constantly bringing new ideas to light. According to Statista, the value of the health and wellness market in the UK has grown year-on-year since 2013 and covers a range of topics including healthy eating, staying fit and mental health. With the UK sector worth more than €26 billion (£22.9bn) and set to gain more momentum than ever, it shows that people are heavily willing to invest in themselves. Over the years we have seen such a variety of diets such as the Atkins diet, the caveman and the paleo diet, for example. Each attract their own cult following for individual reasons, but by getting involved you are seemingly doing much more than just trying to be health and body conscious, but more becoming part of a lifestyle shared by millions of other people. Currently, we are seeing more and more interest in the origins of our dishes, the belief being that food with lesser food miles is great for environmental sustainability as well as being positive for your health. It means, however, that the focus is back on farmers and how they rear, care for and produce our food. And after what seemed like a long spell of food bloggers and celebrities championing a plantbased lifestyle, it is encouraging to see a new trend of foodies – especially athletes and those who train intensely – looking for a meatier, more protein heavy diet. Exercise is also a key player in the crossroads between health and farming. Tom kemp, founder of Farm Fitness, Essex, set up a gym on his 242-hectare (600 acre) family farm, knowing that the outdoor setting and environment was key in establishing the right mindset for those wanting to train. “The body isn’t necessarily made to adhere to the regime of workouts in the everyday gym,” says Tom. Tom’s set up was named as one of the best gyms in the world by Men’s Health magazine and he believes that by connecting fitness to the farm, the outcome and exposure can only be a positive one for both. In 2017 Welsh athlete, Ash Dykes, teamed up with Rhug Estate to create the Ash Dykes Mission Possible Meat Box. It was born from a passion for quality, organic meats and as an extreme sportsman, diet is essential tomaintaining fitness levels and is certainly a step in the right direction in highlighting the positives of eating meat. The farm is one of the largest organic farm shops in the UK and has attracted high profile chefs such as Marcus Wareing before, an obvious testament to its produce. This kind of partnership helps to bring farming to the public eye and with Ash’s popularity on social media, he is a great role model to those looking for a way to become healthier. 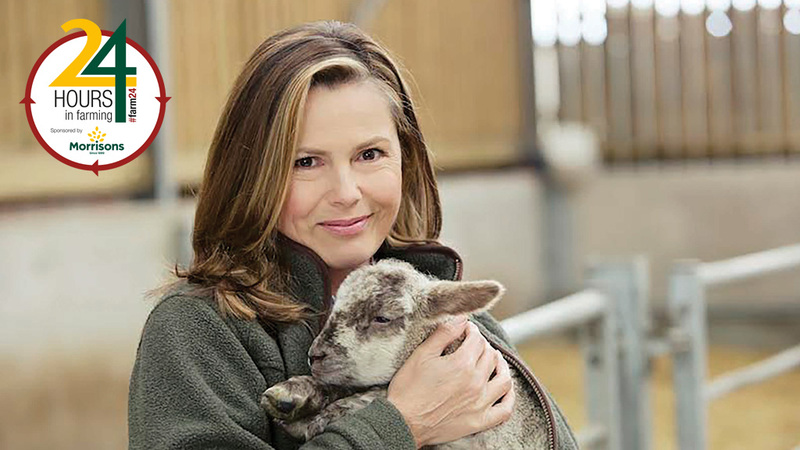 But TV personalities are also bringing the farming, food and health connection to a different audience, with celebrities such as Liz Earle (pictured above), well known beauty and wellbeing expert, championing British produce and cooking with it on prime-time TV shows like This Morning. Liz, who runs 70 Pedigree Hereford cows on 140 hectares (350 acres) in the West Country, is an advocate for showing how working with the rhythm of the land leads to working in rhythm with our bodies and our health. “Grazing is essential for the re-fertilisation of soils and the microbiology of it. “I used to say you are what you eat but now I say you are what you eat has eaten because that’s where it actually starts,” she says. “We should be eating less meat, but better quality. Yes, we may have to pay a bit more for it but it is likely to be more nutritious and it means more of the premium will go back to the farmerand our shopping bill will be balanced by less expensive other foods. There is also a huge market for using your farm as a health retreat, utilising the space and proximity to nature as a way to relax and revitalise. Percy’s Country hotel, Devon, now offers organic food and special diets to its visitors and are promoters of alternative routes in terms of healing, especially to those who have been diagnosed with terminal illnesses. Tina Bricknell-Webb, chef and owner of Percy’s, says: “Instead of the restaurant, people now come here for the ultimate chill out breaks. With a passion for healing through diet, Tina advises anyone who contacts her with an illness or health problem to seek-out a nutritionist and she will then cater to the person’s specific needs. AUGUST 9, 2018, is the agricultural industry’s chance to use its collective power to demonstrate the hard work which goes into producing the food we eat. Farmers Guardian has once again teamed up with Morrisons to host the industry’s biggest online event. For 24 hours, we are asking anyone within the farming industry to use their social media accounts to share posts, pictures and videos about the work they are doing throughout the course of the day. The idea is to flood social media with farming activity to champion the industry and the food produced. Anyone can take part on any social media platform, simply by using the hashtag #Farm24. To find out more or for videos and tips about what to share on the day, visit here.